A scan of a color copy of the original computer printout, taken several years after the 1977 arrival of the Wow! signal. Credit: The Ohio State University Radio Observatory and the North American AstroPhysical Observatory (NAAPO). (Phys.org) -- Back in 1977, on August 15, to be exact, a mysterious radio transmission was received by astronomers working at an Ohio State radio observatory. 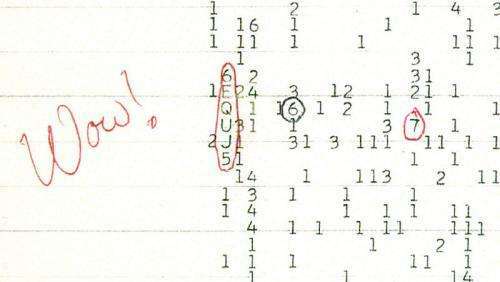 It lasted all of seventy two seconds, and was so unique that one of the impressed researchers, Jerry Ehman, scrawled the word Wow! on the printout, giving a name to the only such transmission every recorded. Its never been heard again and scientists are still at a loss trying to explain its source. Now, to commemorate the anniversary of the reception of the Wow! transmission, the National Geographic Channel is sponsoring a Twitter messaging event that will result in Tweets from people from all walks of life having their messages combined into one giant Tweet back to those who may have sent us the Wow! message, perhaps inciting a similar response from beings somewhere out there beyond the edges of our ability to see them. Not everyone is convinced the radio transmission was sent from alien beings of course, but in this event, that doesnt matter. Anyone who wants to participate is invited to send a Twitter message to #ChasingUFOs (the name of a new show to be broadcast on the National Geographic Channel) between the hours of 8pm and 3am EST Friday/Sat June 29-30. All messages sent will be mashed together and broadcast in the general direction from which the Wow! transmission is believed to have come (in the constellation Sagittarius) on August 15, 35 years to the date after the reception of the mysterious signal. The Wow! transmission has had astronomers scratching their heads ever since it was first received by OSUs Big Ear observatory. Its signal was 30 times stronger than all the other normal ambient noise, making it really stand out, but despite extensive research, scientists still cant come up with any reasonable explanation for its source, leaving those with less scientific leanings to conclude it must have come from aliens. Its those people that the National Geographic Channel is trying to reach with its new show, Chasing UFOs. In the show, a team of investigators will be sent around the world to investigate claims made by people that say they have seen extraterrestrials. Thus far the team has already looked into the infamous Roswell incident, where eyewitnesses swore they saw an alien craft crash into the desert floor, and the more recent sighting of a mysterious triangle of green lights hovering over Phoenix just last September. The team examines the evidence and tries to offer reasonable explanations for what has been found. As an added bonus, those who add their 140 characters or less to the grand alien tweet, will be able to see their message, streamed along with others crawling along the bottom of the screen when NGC airs a program covering the Twitter event on August 15. Oh Christ. Send them this as well. Also send them a recipe on the best ways to prepare humans for eating. Why does most everyone think that if there is life out there that they just want to be friends? They are just as likely interested in eating us or taking the place over. My personal theory is that advanced technology and aggression cannot coexist since they will cause the self annihilation of the civilization. I think that if you have the ability to travel through deep space, you have learned peaceful coexistence. If you can travel through space, I don't think resources or food are your driving motivation. You would have solved both of those long before. Kepler is already finding planets out there. Imagine what aliens could do with their technology. If we can see other planets, advanced aliens can see us already and probably have been able to for centuries or more. Our transmissions quickly dissipate into background noise. Anyone close enough to hear them knows we are here. I think that if you have the ability to travel through deep space, you have learned peaceful coexistence. The idea of an entity calmly and silently dismantling a human body into its component tissues is somehow more disturbing. Of course the comment is right that life forms as advanced as to traverse the universe will not have aggression. One of the main reason will be they should be able to artificially create anything so a human as a source of food is defunct or any other resources for that matter. Afterall, anything can be made from Hydrogen. Also. life form of such technology won't need to dismantle a human physically. They may not need to. That doesn't mean they won't want to. Who knows what will motivate them? They're alien and inhuman, by definition. life forms as advanced as to traverse the universe will not have aggression. In Forge of God by greg bear, an advanced species saw humans as a threat because of our potential for growth. -But I agree that by the time something is able to travel here it would have been designed expressly to do so, by a machine intelligence interested only in its own survival. Which is what the human race will eventually evolve into, or be replaced by. And the best way to ensure survival is to learn as much about potential threats as it possibly can. It may need to send out peripherals to do this, which is what we may expect to encounter if anything. I would also think that machine singularities would be dotted about the galaxy and would be more interested in each other than with us, as these fellow entities would have a great deal more info to offer. But I am sure they would want to know everything about everything, including us. ""alien" Wow! signal from 1977"
-Perhaps we just happened to inadvertently pass through a coherent communication beam between entities? 6 EQUj 5, that must be a joke. Trust NGC to pull a cheap publicity stunt for their crappy UFO shows. And how exactly are they going to send this 'tweet' - through a cell phone tower? That won't even reach LEO! But what if their God doesnt tolerate impurity? (USA is one of the most technologically advanced cultures and still worships the magic sky daddy so intellect, technology and religon arent mutually exclusive). What if they assume that since they are superior that we should serve them (perhaps as entertainment?) and our resistance is futile? What if they get off on blowing up primitive planets? What if they see us as bacteria? Do you 'blow up bacteria' just because you happen to know where some are? At some point the gap between species becomes so large that there's really no point in interaction (of any kind) - other than maybe observation of the 'dumber' one by the 'smarter' one. But what if their God doesnt tolerate impurity? I'm thinking that once you really (I mean REALLY) experience the vastness of space -by travelling through it- faith doesn't stand a chance. There's no explanation you can come up with that would justify so much emptiness just to set up some 'chosen ones' in some neck of the woods. Unlikely as they won't survive in our conditions and we won't survive in theirs. There's no point in servitude at all for a species even marginally technologically advanced. Yes. It's the reason why we wash our hands with sanitizers. There's no explanation you can come up with that would justify so much emptiness just to set up some 'chosen ones' in some neck of the woods. Why not? God is great etc. etc. so of course he would create the entire infinite universe to serve us. My hypothesis is that the majority of flesh type alians eventually become ball like space dwelling creatures once a solar system reaches a population of a hundred trillion or so. This is the future for the poorer space dwellers born in the Dyson spheres of our galaxy. Does anyone else have any favourite speculations of the evolution of fleshy humans in space within the next few thousand years? My personal theory is that advanced technology and aggression cannot coexist since they will cause the self annihilation of the civilization. If you have the ability to travel through deep space, you have learned peaceful coexistence......resources or food aren't your driving motivation. Since when is "need" to eat and gain resources the only reason to explore? Contrary to your inference, human conflict has far more to do with "want" rather than "need". In regards to coexistence, the problem is on what level. You seem to think they'd accept any life form and level of development as worthy of coexisting with them. We could be deemed as below the threshold of what they'd consider self-aware. Being so deemed even aliens who believe as you do could destroy us, because we don't matter. If humans are at all typical of life, aggression is a catalyst for advancement. Because this benefits you. But right now you sit at your desk. Do you feel the need to eradicate all bacteria outside your window? (or even on your desk)? Why would you? There's just no point. There's no benefit to a species to eradicate another species that doesn't even share the same living space or competes for the same resources. God is great etc. etc. so of course he would create the entire infinite universe to serve us. That contradicts what you said before. If you deem something below the threshold of being worth to be noticed then there's no point in being aggressive against them (and certainly not to the point that it 'catalyses your advancement'). At 'best' you might inadvertently destroy it. There is no one or thing out there, including us. one giant Tweet back to those who may have sent us the Wow! message, perhaps inciting a similar response from beings somewhere out there beyond the edges of our ability to see them. This is exactly why after 3 days I quit donating computer time to SETI and moved on to more helpful distributed computing projects. I just knew some bozo's would try to send a signal back. The entire natural interspecies history on this planet is a continuious scenario of consume or be consumed. What mental disease makes these people fantasize that this law of existence does not apply elsewhere? But what about when they do? Delusions tend to create schizms, since no two people ever agree on the exact nature of a delusion. That's where the antlike subordination comes along. That's why they'd be coming here instead of staying there. Why do you think the Mayflower crossed the atlantic? The point is, that there is no limit to stupidity. Like James Burke said, the world is exactly the way you say it is - all you have to do is say. It works both ways. Yes flesh and space are incompatible. Machines will inherit the cosmos and probably have already done so. The 'Berserker' series by saberhagen speculated on a self-replicating machine intelligence designed as a doomsday weapon by a malevolent race which unfortunately did not survive their own weapon. It spreads throughout the galaxy like the Borg, exterminating life wherever it finds it. Religions are doomsday weapons designed to exterminate each other in much the same way. Machines will have no use for them. The mayflower is an interesting example of man/machine interface. As we mature our machines are becoming smarter and the distinction between us and them becomes less obvious. They are installing cranial networks which will be able to internalize communications and outsource our inefficient brain functions. The transition began long before the pilgrims set sail, when we invented knives rather than evolved talons. "Yes flesh and space are incompatible." I know bones are incompatible even in shielded space but I think flesh would survive in shielded space. What do animal experiments on the space station show us? Why do you think the Mayflower crossed the atlantic? They werent't out to sterilize new lands. Now do you really think that all of this will be fit for any species anyhere else in the universe? I.e that we (or they) live in an environment where we actually compete for the same resources? That's just ludicrous. In a sense, they were. The Puritans were running away from religious persecution to maintain their own style of religious persecution. They wanted to go somewhere they can be as bigoted and righteous as they wish, without the Church of England telling them when they've gone too far. They went to the new world to make it their kind of world. End result: salem witch trials, loads of dead indians etc. etc. And the Mayflower is an entirely different isssue. So you didn't get the point of it then. It was an example of how religion and strife can drive the expansion of a species into new territory without requiring that everyone is peaceful and hunky dory with each other. As far as the settlers were concerned, America was like a new planet. There was no guarantee that they'd even survive their first year there. Not chimps as far as I know, but some do wage a war on aye-ayes because of superstition that they steal your soul with their eyes or spell your death etc. They're perfectly harmless creatures - they're just very ugly. But there are other reasons to exterminate a non-competing species. For example, if its habitat just happens to be in the way of your new intergalactic highway.
. It was an example of how religion and strife can drive the expansion of a species into new territory without requiring that everyone is peaceful and hunky dory with each other. The point is that it's so phenomenally unlikely that our ecosphere is anything that aliens actively would want to live in - there's no real point in worrying about it. If they can adapt themselves at will to a wide range of environments then there is doubly no reason to go somewhere already inhabited. There was no guarantee that they'd even survive their first year there. "I don't think resources or food are your driving motivation. You would have solved both of those long before." Yeah, they solved their problem by developing space travel where they can jump from planet to planet getting food. It's possible. Neither did the Puritans want to go to America, but what other choice did they have? Try to overturn the Church of England? You're getting hung up on the technicalities of the issue. The meat of the argument is that you don't have to be particularily peaceful - which is a relative term anyhow - to be able to coordinate technological feats on the order of travelling through space. Technically, we could be sending spaceships to the Barnard Star right now. Maybe the alien species is doing what the British did, and sent all their criminals and other unwanted people on boats to Australia and America with a one-way ticket, as an alternative to hanging them and dealing with the PR problems. The possibilities are endless, so assuming that aliens must be, or are even likely to be peaceaful is just wishful thinking. Aliens smart enough to get here will be able to grow their own food with robots far more easily than using interstellar hunter gathers with culinary training. The only thing we have worth being interested in are a new example of an independant biosystem and a primitive culture to study. Everything else exists in abundance elsewhere or could be synthesized easily. It may also be possible that life in a far advanced civilization is so interesting that moving beyond a few nearby star systems carries little interest. @ Lex Talonius, You're in the wrong web site. Just in case anyone misunderstands, a lot of people are incorrectly blamed for troll posting because their ideas and opinions are unpopular or disagreeable, but Lex just provided us with a classic example of a troll post. It was of no topical value and is only designed to create an emotional response. Neither did the Puritans want to go to America, but what other choice did they have? That puritans could survive in america is infinitely more likely than aliens could survive (unaided) here on Earth. It's so much more likely that they didn't even worry about that (surviving the passage was much more unlikley. The ocean, a habitat on Earth where we evolved, is already a hostile environment to humans. think of how much more hostile any part of Earth must be for any kind of conceivable alien - even one that originated via panspermia). meat of the argument is that you don't have to be particularily peaceful to be able to coordinate technological feats on the order of travelling through space. I agree. Where I don't agree is that there could be any conceivable motive for an alien (spacegoing!) race to wage war on any other. Certainly not for land, not for resources, not for supremacy or purity or any other reason. Interstellar species don't share enough context for that. Where I don't agree is that there could be any conceivable motive for an alien (spacegoing!) race to wage war on any other. Certainly not for land, not for resources, not for supremacy or purity or any other reason. Interstellar species don't share enough context for that. The limit to your argument is what is conceivable to us. While many would like to think than an advanced species should be more socially or morally advanced than we are, this does not have to be the case. These species would be alien by definition and in reality extremely different from us. Just as it would be unexpected for an extraterrestrial species to be able to survive in our environment without technological assistance, we should not expect them to think as we do. Truth be told; 95% of modern humans couldn't survive in the earth's environment without assistance from our technology. That puritans could survive in america is infinitely more likely than aliens could survive (unaided) here on Earth. First off, 'infinitely' is a poor word choice. Secondly it depends on what you mean by 'aided'. Aliens which have been designed and configured expressly for the purpose of thriving in earthlike environments would need no aid. They might be much better at it than naturally evolved earth life. We can already conceive of many improvements to the human form factor. We are already fixing the many faults that evolution has produced. It is to be expected that Intelligence from elsewhere would be much better at this, and would create purpose-built colonists. AND these would certainly resemble machines more closely than animals, unless of course there were some reason to disguise themselves as such. There is no reason to think that sufficiently advanced beings, including our future selves, would be locked into any one form. Wow. This makes me nervous for National Geographic. I was not aware that this was totally unexplained, but there could be hundreds of sources, besides alien intelligence. Now if a similar signal were received today, would it be so easy to identify? Probably not, if it never resumes or repeats. A one time burst could be anything, sub harmonics from a neutron star merger, a black hole being born, a magnetar exploding, etc...still. Interest in SETI may be served from such a participatory event. Isn't it humbling? To realize how much we really haven't figured out yet, about the Universe' workings and the how's and especially the why's? Gravity may be partially understood, but without confirmation of the Higgs Field and the Boson, how and why are still up for grabs. Einstein described how gravity operates, his equations fit observed gravity's actions, very well. Details. Light is also, not fully understood. We have millions times more to learn, than all of history's scientists have figured out, already. There are parts of the Universe we will never even see, because they are too far away for their light to even reach us. Expansion of space. That is a certainty, is it not? While many would like to think than an advanced species should be more socially or morally advanced than we are, this does not have to be the case. Think about where social norms and morals apply. They only ever apply to the same species. Applying human morals to dogs or Earth bacteria isn't sensible. And dogs (or Earth bacteria) are much closer to us than any alien could be. As I said: If they can do that then they can configure for many habitats. Why choose Earth? (Why choose ANY habitat at all?) Certainly if they go in a technolgy/machine-fusion direction then the concept of needing a certain habitat goes out the window. In that case existing on an asteroid or in open space would be as 'good' (in many ways much better) than walking around on Earth. There are parts of the Universe we will never even see, because they are too far away for their light to even reach us. You don't need to see everything to understand stuff. You can know that you can read a book even though you will never open it - just by knowing that you understand the rules how to read it. That we still have a lot to learn is without question. But it would be boring otherwise, wouldn't it?